For all the supposed progress we’ve made since 1973, there’s still no better movie about demonic possession than William Friedkin’s The Exorcist. 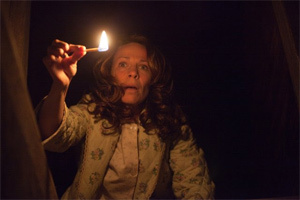 Having said that, it’s worth noting that The Conjuring qualifies as a tense and creepy addition to the “demon” genre, a movie notable for a strong cast and for director James Wan’s willingness to continue moving away from the digustingly graphic displays that marked his torture-laden breakthrough, 2004’s Saw. That’s not to say that this amped-up funhouse of a movie is without its quota of silliness — only that Wan, who also directed 2011’s Insidious, creates enough gut-tugging tension and palpable disturbance to lift his movie out of the horror doldrums. Although the “thrills” in Wan’s horror show — purportedly based on a true story — are as jolting as they are scary, they’re delivered with a seat-rattling force that works on you. The creepiest effect: a game called “hide and clap” that involves blindfolds, hand-clapping and increasing amounts of dread. The story focuses on the Perron family — mom (Lili Taylor), dad (Ron Livingston) and five daughters. The Perrons move into an old Rhode Island farmhouse only to find that the place is full of bad smells, unexplained noises, a super-creepy basement and sudden unexplained drops in temperature. The nightmare escalates to the point at which the desperate Perrons seek the help of Lorraine and Ed Warren (Vera Farmiga and Patrick Wilson), demonologists (hey, everybody has to be something) who have a history of ghost busting. Lorraine is acutely sensitive to paranormal phenomenon, and Ed has assisted in exorcisms. To the movie’s credit, it takes an hour and half to introduce a priest, a character who needs Vatican approval before he can help a family that includes unbaptized children. Church bureaucracy forces Ed into a DIY exorcism that gives the movie its screeching finale. Although Wan keeps the gore quotient under tight control, he relies heavily on a rumbling sound track and special effects when it comes to the major jolts. The more we see, the less effective the movie becomes, but as Ed and Lorraine chase the demon they’ve identified as Bathsheba, Wan whips up a fair measure of creep-out chills. The screenplay even tries to include a bit of recognizable behavior. The Warrens are portrayed as a couple accustomed to being greeted by skepticism. Both Farmiga and Wilson — neither working at particularly deep levels — do their best to humanize the Warrens, who are presented as a normal husband and wife, aside from their ability to hunt demons. Did I mention that they also keep a collection of eerie artifacts in their home? The stories of the Warrens and the Perrons don’t always mesh, and The Conjuring seems to work a little too hard at trying to convince us that there really are demons and devils in the world. A better movie would have felt no need to lobby for the paranormal. But as haunted-house horror goes, The Conjuring should give audiences pretty much what they asked for as it finds high intensity ways to put us on edge with a ton of ploys that have become obvious horror standards: Characters open doors we know they shouldn’t; they go down basement stairs that clearly should be avoided, and otherwise put themselves in the path of a demonic force that’s out to wreak as much havoc as possible. Damn those demons, anyway.